About - Patton Properties, Inc. 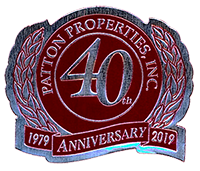 Welcome to Patton Properties, Inc.
Patton Properties, Inc., established in 1979 to be a full brokerage company. We have represented more than 350 owners over these many years; have clients whose children now are our clients. We have had more than 10,000 tenants and have children of those tenants who now lease from us. We specialize in managing scattered residential properties in Columbia, West Columbia, Cayce, Lexington, Irmo, Chapin, Lake Murray, and surrounding areas for individual owners. Why not trust your investment to an experienced local manager with proven abilities, systems, integrity, industry knowledge, and management expertise. If you own a residential investment home and are looking for professional management, look no further. We provide full management services; including marketing, tenant screening, leasing, maintenance, and accounting. We are also available to renovate or sell your property. If you are looking to rent, we have an excellent inventory of houses, apartments, and condos for lease. You can view our available properties and apply to rent with us on line. We pride ourselves by offering personalized and professional services to both our clients and customers. Pam is a Columbia native where she graduated from A.C. Flora High School. She was destined for real estate from an early age. Pam began working in the family business as a teenager afterschool and on weekends. With more than 12 years of experience in property management, Pam enjoys making things run smoothly for the owner and the tenant. In her spare time, Pam enjoys bike riding, music and spending time with her husband, their 2 children and their furbabies. Olga was born in Cuba but has been in the US since 1971 and currently resides in Columbia. She has over 11 years experience with both single family and multi-family property management. Olga attended real estate school at Trident Technical College in Charleston SC; she is a licensed property manager and is fluent in Spanish. Olga enjoys spending time with her children and pets Sheba and Snow. John is a Columbia native where he attended A.C. Flora High School. He comes from a real estate family and is following in their footsteps. He looks forward to making the process as easy to understand as possible for both the owners and tenants. He enjoys golf, soccer, going on hiking trails, and generally being outside, with his wife and two cats.